Despite having regular holidays to North Wales for many years now, I have only been to Anglesey once. It is a beautiful island and I decided during my recent holiday it was time to visit again. I had two main places I wanted to visit; an art gallery in Beaumaris and Plas Cadnant. We got distracted by Beaumaris Castle, which I have to say is a very good castle. It has it all, a moat, ruins and a good wander around the top of the castle walls. I struggle usually with wall-top walks but there are quite good hand rails so I felt relatively safe. Anyway, after some picture buying and castle wandering we finally arrived at Plas Cadnant. I was immediately impressed at how well thought out it all was. They have a really nice cafe so we had a quick lunch and then set off to explore the delights of the garden. The entrance takes you straight into the formal pointy tree garden. I have mentioned before how much I love a good pointy tree garden. They supply you with a map when you arrive and this gives you a suggested route. We decided to be compliant and follow the map. Immediately I got distracted by this fantastic bit of espalier work. Impressive stuff. Outside of the holiday cottages there is a small formal garden. I thought this rather well done. and glimpses down to the pointy trees through these wonderful dark red hydrangeas. There is a woodland walk that leads to nice waterfall. this hydrangea 'quercifolia' stopped me in my tracks. It was so beautiful. As we headed back towards the formal gardens there is some rather fine topiary. At the end of the pointy tree avenue there is this formal pond. I loved the ferns growing into the walls. They had rather fine walls in general. There is a lot more to this garden than I have shown. 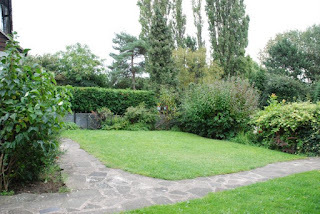 It is a garden that is work in progress as it had been neglected for many years before the present owner bought it. I really enjoyed my visit and will definitely visit again. .... this hydrangea jumped into the car and demanded to be taken back home. Well it would have been rude of me to refuse. How could you possibly refuse the hydrangea! A glorious colour. 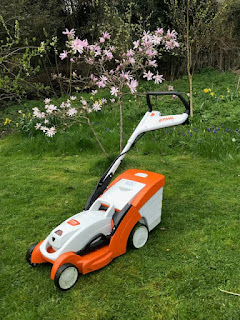 I have been looking forward to your post on Plas Cadnant, though it feels faintly ridiculous to have someone on holiday tell me about a garden on my own Island! It really does look wonderful, I shall look forward to visiting in due course.